Let's say that your next conference will be held for all your organization Employees, which their number could be from 15000, to prevent some small problems like missing someone or even duplicating a name and wasting of time, we - In Masterbadge - provide you with internal employees tab. 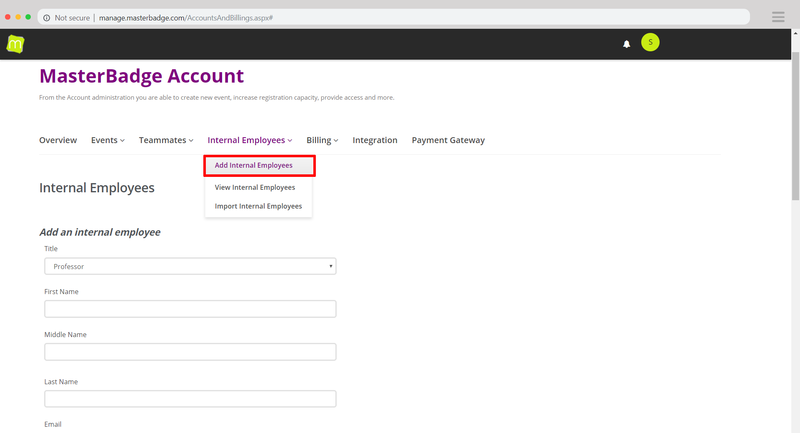 The internal employees tab can be accessed only be the account admin. It enables him to add, remove and edit any internal employee in the organization. By adding each single internal employee, you will save the added details as database to be used in the upcoming events, either it is internal or external and organized by your organization. Internal employees can be added in the event by the teammates controlling specific events. The fabulous part is that you can export an Excel sheet to be added as database for all the internal employees with no need to add each name manually and separately. This professional feature will save more time for you and your team.